Wordcamp Miami is an amazing value for the price, well organized, has good opportunity for networking but may fall short of technical content expectations if you’re an advanced web developer. 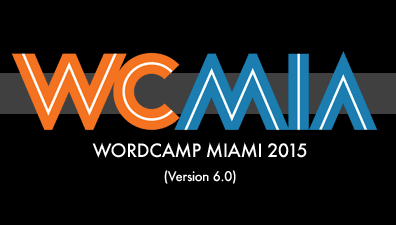 I’m not going to try to give you a comprehensive, objective review of Wordcamp Miami 2015. Instead, I want to share how the experience was for me, with my specific background. What background, you ask? For nearly 20 years, I’ve been developing web applications. A healthy amount of time each week is dedicated to digesting more tech goodness. Just a few months ago, I quit my job to go independent. And so, the content below is created through that specific view. Wordcamp Miami is, beyond any doubt, one of the best values of any tech conference I’ve attended. I purchased my tickets within the early bird window. For 2 full days of talks and an optional full-day course, I believe I paid $40. That $40 also includes a nice swag bag, 3 lunches, 1 breakfast, miscellaneous snacks and coffee. What a bawgain! The conference was held at my alma mater, Florida International University. Each of the three tracks of the conference had it’s own room in a separate building, all close to each other. Parking was surprisingly close. I stayed at Comfort Suites that was about 5 minutes away. Again, a great value for the money. It was clean and friendly and that’s all I ask. Breakfast is included. When a conference is poorly organized, it’s obvious because there’s plenty of things to complain about. For example; poor signage, lack of communication, audio / video issues, etc…. This was not that type of conference. Although there was the occasional A/V glitch, everything was extremely well organized. Honestly, the organization was nearly flawless. Here’s where my expectations were just a little too high. This was my first Wordcamp so I didn’t know the level of depth of the content. My only experience with conferences prior to Wordcamp are PHP-specific. The first day, Friday, was the full-day course. I chose the ‘Front-end & WordPress Theme’ course. I didn’t take a single note that day. One of the speakers was teaching techniques that are contrary to best practices (designing by device), and another speaker thought he blew the attendees’ minds by reviewing FlexBox, and disappointingly, he did. Although I was let down by the lack of technical content, I did meet some nice people and I got a lot of client work done during the talks. Although still not quite up to my expectations for content, the next couple of days were a bit better. I took exactly 116 lines of notes with the majority being marketing-related. That’s really not a lot for three days. Now don’t get me wrong, I did pick up a few things. There’s always one more track that’s rarely printed anywhere, it’s become known as the Hallway Track. This is the exchange of information between attendees in the free time outside of the normally scheduled talks. Like any other conference, some of the best nuggets of information can be found here. My only gripe of the conference is that there was a 2-part Genesis mini workshop where the second part was almost entirely non-Genesis related content. Roughly 80% of the talk was on Sass, which I use in my daily workflow and thus learned nothing. I corrected the speaker’s code which I’m told wasn’t rude. I don’t think I would mind if someone helped me improve my slides if I were presenting, would you? Wordcamp Miami 2015 was a fairly good experience. I met some great people, learned a couple of things, and taught a few. I’ll attend next year but I’ll be sure to pitch a presentation first. Absolutely! It was great meeting you too Shanta!